Great timing - and I love the people at the end across the way. 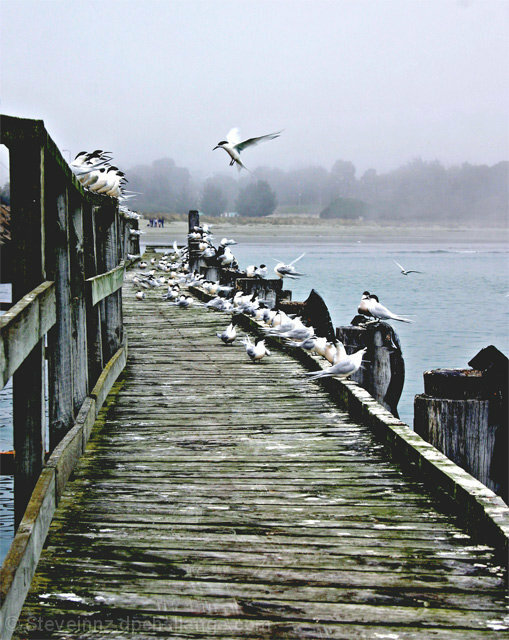 This is really cool shot I like the play of the fog and the coloring of the birds. And I like how all of the birds are all lined up. Oh, i really like the realism here. wow where is that.... cool perspective . nice lighting. How could anyone not love this? It is marvelous! You were in a great place and composed a very good shot. But either the quality of the original image or something in your post production has the colors and details in this looking very muddy. I like the colors and I like the action you caught this picture in. Nice job. It reminds me of Maine. Great contrast. Nice detailing with the wood. The birds' movement helps add to the appeal of the shot. Well done. Proudly hosted by Sargasso Networks. Current Server Time: 04/18/2019 09:17:15 AM EDT.